OFC16L >>> จุสาย 20 lbs. / 350 yds. อัตราทด 4.3:1 น้ำหนักเบรค 15.75 kg. น้ำหนักตัวรอก 650 g.
OFC16H >>> จุสาย 20 lbs. / 350 yds. อัตราทด 6.2:1 น้ำหนักเบรค 15.75 kg. 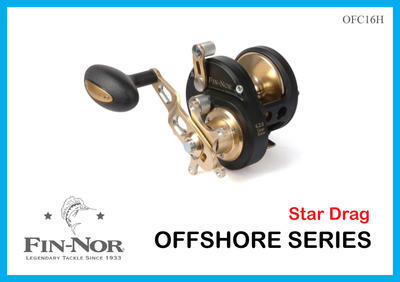 น้ำหนักตัวรอก 650 g.
Fin-Nor's Offshore stardrag conventional series is designed perfectly for trolling deep waters or casting to record fish. A complete line-up offers you the choice of two different powerful and fast retrieve speeds to match your style of fishing, in three different line capacity sizes. Fin-Nor's Offshore 11-disc, multi-stackd drag system, with both stainless steel and carbon fiber disks, offers extreme control and smooth performance. Plus, with a solid diecast aluminum body, Offshore stardrag reels are the perfect tools for trolling big water.